I am SO excited to share with you these gorgeous coloring ornaments that are all about the names of Jesus! When I wrote Unwrapping the Names of Jesus: An Advent Devotional envisioned it being read by middle-aged women sitting in their living room chair with their morning coffee. And a lot of readers did fall in that category. But I was pleasantly surprised to discover so many young families were using it as a family devotional with their children! Our heart behind the Advent devotional is that everyone will find time and space to prepare their hearts to celebrate Jesus’ coming by learning more about His Names and falling in love with Him. And we wanted to help parents of young children teach their kids Jesus’ Names in a way that made sense to them. So I asked Flaviu to draw coloring ornaments, and as usual, he exceeded my expectations. Aren’t these lovely? Paired with Unwrapping the Names of Jesus: An Advent Devotional, these coloring ornaments help communicate the truth of who Jesus is and why He came to earth in ways that are accessible to all children from toddlers to junior highers. Each day’s devotion focuses on one name of Jesus and corresponds to one of the ornaments. How do I get these ornaments? What age range are these ornaments for? Are the ornaments available for purchase? The ornaments are free with any kindle or paperback purchase. You can’t purchase these ornaments separately. Consider them a bonus resource that comes with the book. Can I give them away? 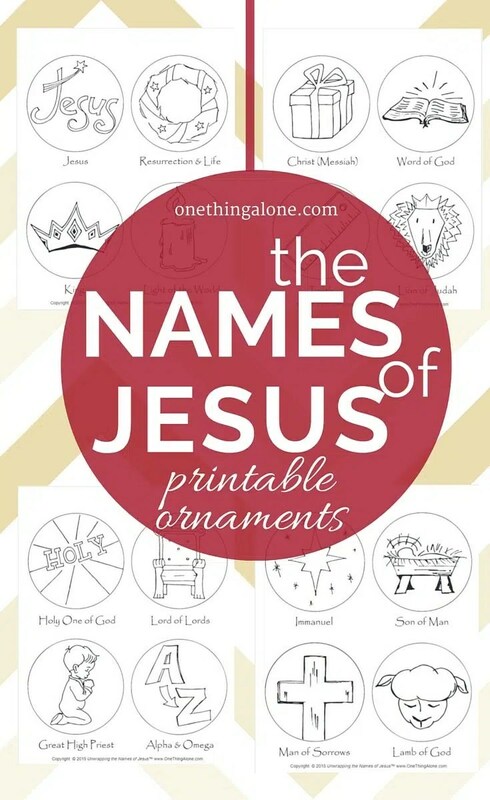 These ornaments are best used and understood when paired with Unwrapping the Names of Jesus. For that reason, we ask that you not share your file. Instead, encourage your friends to get their own copy of the devotional here and go through it together! I don’t have children. How else can I use these ornaments? Feel free to color them yourself! As we’ve discussed in recent months, coloring and doodling is a great way to interact with Scripture and engage a different part of your brain. Also, do you have grandchildren, neighbor kids, or family friends who enjoys coloring? If so, buy a devotional for their family as an early Christmas gift and include these ornaments as a fun activity. Or invite them over to your house for milk and cookies and a coloring party, during which you can share all about the Greatest Gift of all: Jesus. Can our church use these ornaments in our kids’ ministry? I’d be thrilled for churches to use the devotional and these ornaments as part of their outreach strategy this Advent. Contact me for details regarding bulk ordering. And if you love these ornaments as much as I do, please share this page with your friends. Let’s encourage each other to spend time this holiday season learning about and falling more in love with Jesus. If you haven’t already got a copy of my book, discover the book that gave birth to these ornaments, Unwrapping the Names of Jesus: An Advent Devotional. We are giving away a 3 day sampler! See below!